A radio presenter in 1997 describing rude reckless drivers of white transit vans, called them the White Van Man. Although a recent report has dispelled the myth and actually found these men to be polite and respectful, the label has stuck. I really want to dive in & see what's on his chest!!! Did he know you were taking his photograph? He looks quite serene and unaware, waiting for the traffic to move. 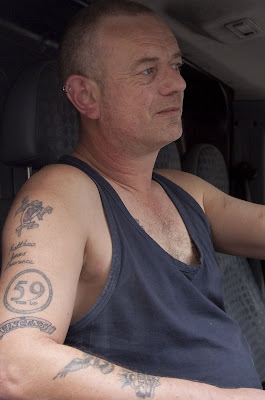 I like reading people's tatoos - I wonder if Matthew James Lawrence are his sons or his names. I'm with Angie - I'd like to read his chest too - and probably his back and legs. yeah, i was also going to ask the same as jabblog. it's a wonderful portrait of a man at work. That's a great picture. He looks like a nice, decent bloke. I hate labels especially because they usually stuck, even to people they don't deserve it at all! Inteersting tattoos. I wonder if he's got more on the rest of his body! Hope you're keeping well, Mo. Ciao. A. Why am I surprised to learn about polite and respectful drivers? There's so much room for improvement in this matter.